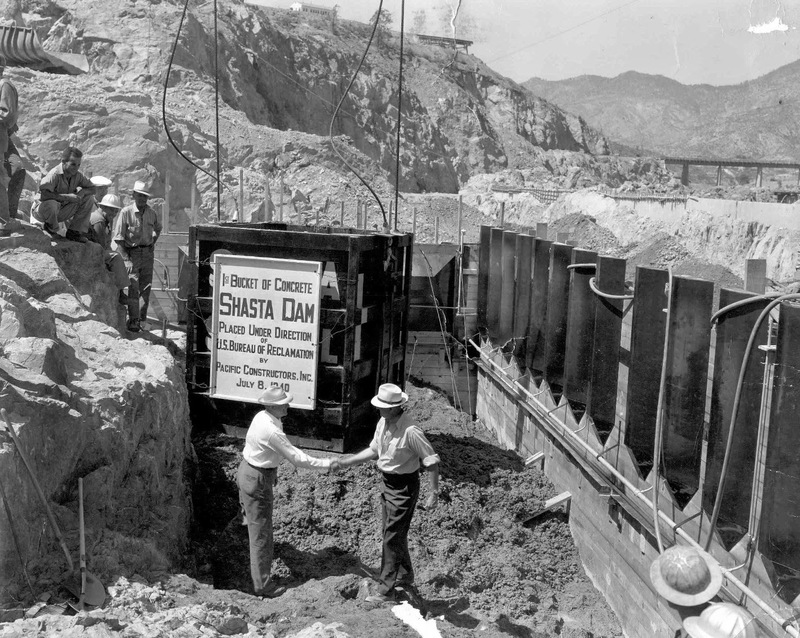 Not many people realize that old Silicon Valley has ties with Shasta Dam and the Liberty Ships of WWII, through industrialist Henry J. Kaiser. Kaiser, owner of Kaiser Aluminum and Kaiser Steel, was reportedly most well known for his Kaiser Shipyards in Richmond, California, where he built Liberty and Victory ships during World War II. He was noted for the innovation of using welding instead of rivets to build ships in just 5 days, a skill which could be taught quickly to inexperienced workers during WWII. Kaiser got the idea to use welding after one of his associates visited a Ford Motor Plant and watched workers on the assembly line. Unfortunately the early ship welds cracked in cold temperatures (called, "brittle fracture"), causing some Liberty ship hulls to break in two at sea, before the hull design and welding process were more closely monitored between 1947-1955. 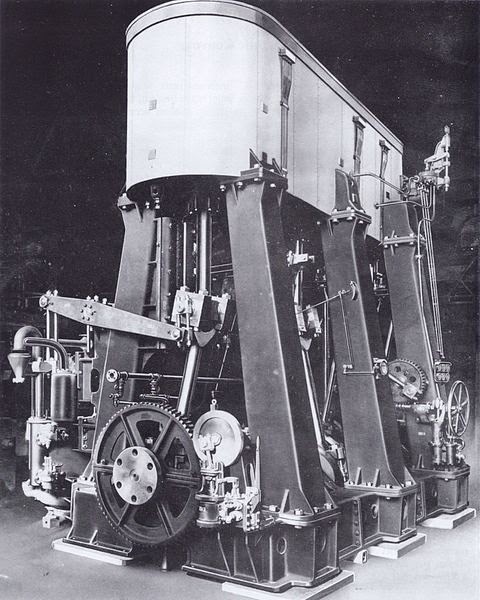 It is interesting to learn that Kaiser was also affiliated with the Joshua Hendy Iron Works in Sunnyvale, which built the EC-2 Triple Expansion Steam Engines for the Liberty ships Kaiser was constructing in Richmond. More history on Hendy Iron Works may be found at the Iron Man Museum, housed at the Northrop Grumman Marine Systems Plant in Sunnyvale. 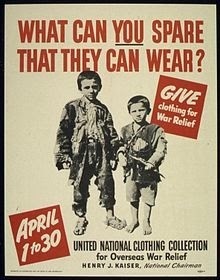 During the construction of Liberty ships, Kaiser saw the need to provide a 10-bed emergency field hospital for workers in a wooden shed at his Richmond Kaiser Shipyards, which were the basis for the Kaiser Permanente medical plans and hospitals which are still in existence today. The original Kaiser Field Hospital in Richmond expanded to 160 beds by 1944, and continued to modernize until it finally closed in 1995 to become the "Rosie the Riveter" historical landmark and musem. During the war era, Henry and Bess Kaiser owned a cabin along Permanente Creek above Cupertino, where Bess felt the creek's name would also be a good name for their Kaiser health foundation, since Permanente creek ran perpetually, year-round, much like their health care for Alameda ship workers. What was once known as the Kaiser Permanente Cement Plant in 1939 before WWII, or Permanente Quarry (also named after Permanente Creek), was incorporated for the construction of Shasta Dam, completed in 1944, to extract the unique seamount limestone from the hills above Cupertino, creating gravel, mortar and cement for dam construction. An old railway line which can be seen near Hwy 85 and Stevens Creek Boulevard (near Cupertino Post Office), was once used to transport lime from the Kaiser Cement Plant to shippers for dam construction. Unfortunately, the Cupertino Kaiser Permanente Quarry has been an alleged source of ongoing pollution and controversy, since passing from Kaiser's ownership and becoming Lehigh Southwest Cement (a Heidelberg Cement Group affiliate). Petroleum coke used to fuel lime production (since 2007), which along with limestone, off-gasses mercury emissions during processing, has led some to believe that the Cupertino Lehigh Cement plant allegedly is responsible for 29% of all Bay Area airborne mercury emissions, perhaps impacting Calero Reservoir, 20 miles away, as well as local waterways. Since mercury is a significant neurotoxin as well as a pollutant, and can become concentrated in local waterways, mercury now exists at allegedly 5.8 to 6.7 times higher in waterways near the Lehigh Cement plant, than at a site 2 miles away. Likewise, groundwater is pumped into Permanente Creek from Lehigh quarry, so Selenium pollution in the creek (downstream from Lehigh quarry) was also found, indicating that the Lehigh quarry is allegedly the source of the pollution. "Quarry operations at the (Lehigh) cement plant have resulted in sediment discharges into Permanente Creek that are 3.5 times what would be expected under normal conditions," according to the USGS. 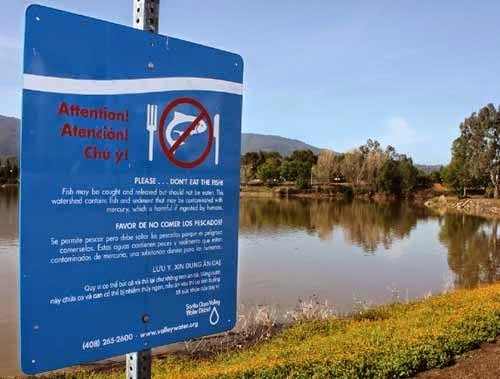 This sediment threatens local fish, which can no longer be safely eaten from Stevens Creek Reservoir or Rancho San Antonio Reservoir, due to mercury pollution levels from the Lehigh Cement plant, according the to City of Cupertino. Lehigh Southwest Cement has been the target of numerous environmental court cases and lawsuits brought by local cities and environmental groups. Bay Area federal and regional water and air quality monitoring agencies and the Sierra Club, have also closely followed mercury and selenium pollution from Lehigh Cement, to counter apparent failures by state EPA monitors to accurately assess risks from plant emissions. Lehigh has worked to to bolster it's public relations efforts in the Valley, making large monetary and in-kind donations to the Cupertino Senior Center, the Cupertino Museum and Historical Society, and other local civic groups. Brass wall plaques can be seen at the Senior Center, West Valley Community Services, and Quinlan Center (near the Cupertino Historical Museum), noting Lehigh Cement contributions to those entities, where Lehigh representatives also serve on boards of directors. 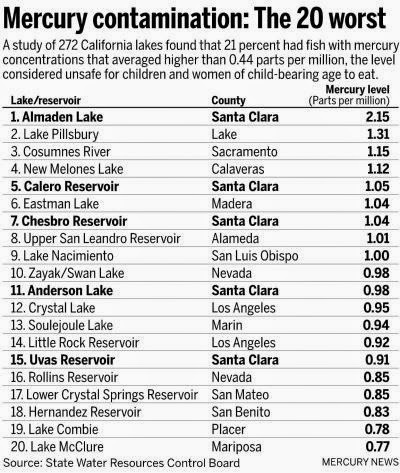 Unfortunately, the 20 worst mercury contamination sites in the state include five sites in Santa Clara Valley, with the worst being Almaden Lake. 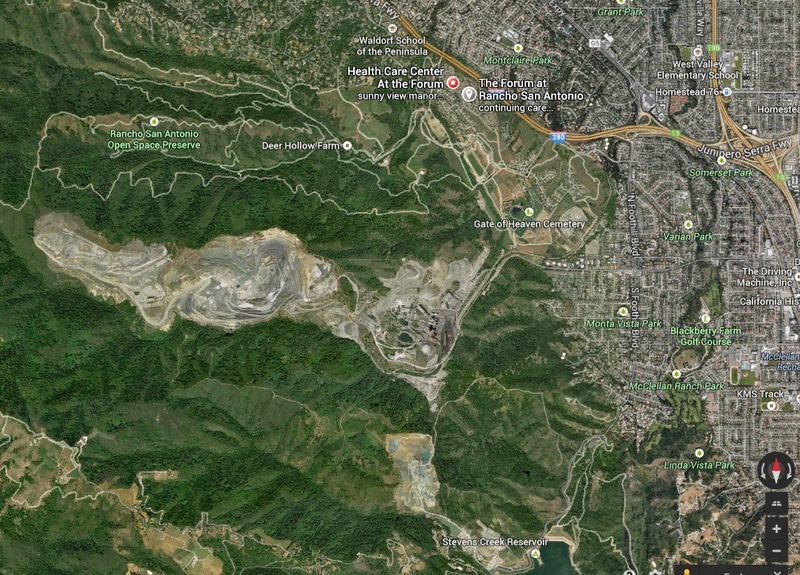 While some mercury pollution can be attributed to the Almaden Quicksilver Mines, the presence of Lehigh Cement pollution is also alleged to be a contributing factor to mercury pollution in our West Valley reservoirs and waterways, according the City of Cupertino. Most recently a $20 million judgment against Lehigh was won by the Sierra Club ($10 million for the clean up of Permanente Creek, plus a $10 million bond, ensuring the work would be done in a timely manner). A Cease and Desist Order was pending against Lehigh Cement for anticipated inability to reach new cement plant EPA requirements in 2014, yet may not be implemented if restrictions are met. The City of Cupertino has documented pollution, violations and lawsuits against Lehigh Cement to raise public awareness about mercury and selenium pollution. A chronology of citations and lawsuits, as well as public hearings concerning Lehigh Cement pollution, may now be found on the Cupertino City Web site.